Chocolate Waffle “Sundae” – Allergen-Free! So I probably shouldn’t admit that I fed this to my Certain Little Someone for dinner… but in my defense, there was very little sugar involved, I swear! I even fed it to myself, because I am trying to omit some allergens – namely, egg, dairy and peanut – from my diet for Baby Boy’s sake to see if it helps clear up his eczema (more on that in another post). I don’t really have a recipe for this because I used the recipes of others smarter than I, but it was my own idea to combine them in the way that I did, so I’ll link you up to the recipes I used and tell you how I did it. 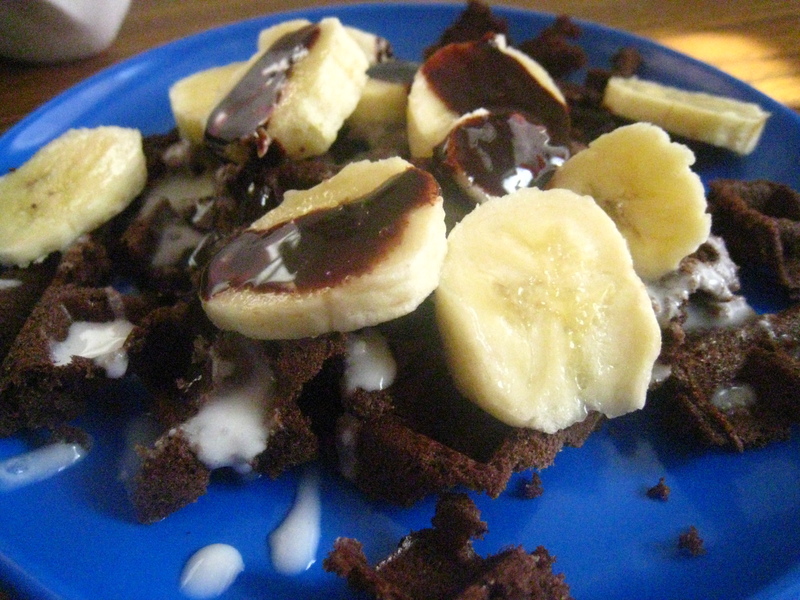 Use this Chocolate Waffle recipe from Cook It Allergen Free (an amazing resource, btw). I used coconut oil in place of the margarine, and I used 1 1/4 cups of a sorghum flour blend instead of the different flours listed at the beginning of the recipe. I personally liked the fact that it only uses a little bit of sugar, but the resulting waffle was not very sweet at all, so if you want a sweeter taste (for example, if you’re making it as a dessert), add a little extra sugar. I topped mine with bananas, but berries like strawberry or raspberry would also be particularly delicious. Even peaches or baked cinnamon apples would be yummy. I used plain sweetened homemade coconut yogurt. You can use any variety of non-dairy plain, sweet, vanilla or flavored yogurt that you want! Be creative! Also, you could use this coconut whipped topping, which I haven’t tried but am definitely going to as it looks amazing. To really make it like a sundae, use coconut ice cream (or other non-dairy ice cream) or a fruit sorbet instead. I used this recipe for chocolate sauce. For one thing, it’s dairy-free (which most, but not all, chocolate sauce/syrup recipes are). I also love that it uses a lot less sugar than most other recipes: one chocolate syrup recipe I’ve seen calls for 2 cups of sugar! I was afraid that this sauce would be too bitter, but it was perfect: a nice dark chocolate taste without any bitterness at all. It does help to use a Dutch processed cocoa, I think. To serve your chocolate waffle “sundae”, first place a waffle on each plate. Top with sliced banana (about 1/2 of one banana for each serving) or other fruit (about 1/2 cup per serving). Place a generous scoop (about 1/4-1/3 cup) of yogurt, whipped “cream” or ice cream on top of the fruit. Drizzle 1 or 2 TBSPs of chocolate sauce over all. So, you want to host a make-ahead party, but some of your would-be fellow chefs have food allergies or sensitivities and you want them to feel safe and comfortable so they can join in the fun. Or maybe you are the would-be fellow chef and you want to join in but you don’t exactly feel safe and comfortable with other people cooking your food. Is it possible to satisfy both sides and hold a successful make-ahead party? I think so, if you follow a few guidelines…. Check out the rest of my guest post at Eastside Make-Ahead Mamas! Baked oatmeal has, in recent years, taken the blogosphere by storm. It seems like every blogger has posted about it at least once, and it pops up on weekly menu plans on a regular basis. I had never tried it myself, though, until this past week, and I was pleasantly surprised! It’s part cake, part oatmeal, part cereal, but all delicious! And it’s super easy to make allergen-free. I started with this recipe and worked from there. s. Pour mixture into a greased 8×8 pan and bake for 35-40 minutes at 350F. Cut into 8 squares. To serve, place a square in a bowl and drizzle with coconut milk (or other non-dairy milk). You can also add raisins or dried cranberries (or any dried or fresh berry) for added flavor and texture. Have a picky eater on your hands? This recipe just might fit the bill! It’s so decadent and delicious, you can easily forget how healthy it is. And it really is healthy, too! 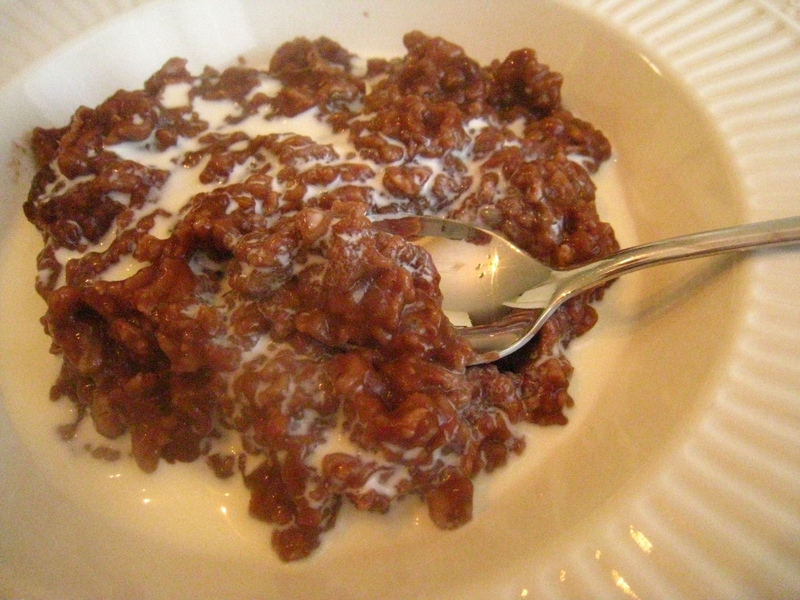 Made only of oats, cocoa powder and honey, with optional non-dairy milk and a dash of salt. What’s not to like? And it’s super easy, too. Just as easy as cooking up regular plain old oatmeal. The only difference is it tastes a lot better! Stir ingredients together in a medium saucepan. Bring to a boil; reduce heat and simmer until oats are soft and liquid is evaporated, about 5 minutes. Cool slightly and serve. Splash with a bit of So Delicious Coconut Milk or Creamer if you want! Do your kids balk at oatmeal? Check out my eBook, No Allergens, No Fuss! for lots more delicious oatmeal flavor ideas, as well as many more super easy allergen-friendly recipes! The easiest and best allergen-friendly main dishes are usually basic and unadorned. Basic and unadorned doesn’t have to mean taste-less, though: far from it! These pork chops are easy and pretty much as basic as it gets, but they don’t lack in flavor. 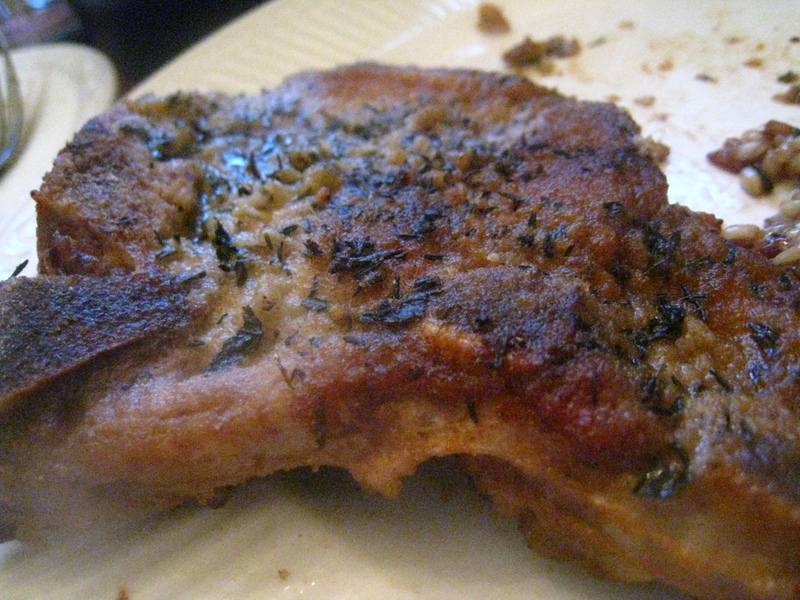 In fact, they are some of the tastiest pork chops I’ve tried. Rub salt and pepper to taste into both sides of the pork chops. In a bowl or plate, stir together the flour and seasonings until well blended. Dredge the chops on both sides in the flour mixture. Heat the oil in a large frying pan over medium-high heat. Add the chops and cook about 4 minutes on each side, covering with a lid. For more great recipes, check out my eBook: No Allergens, NO Fuss! I am hosting my very own “Food Allergy Awareness Week” over at my other blog, Quick and Easy Cheap and Healthy. Please drop by and add your comments if you have additional insights and thoughts to share (which I know you do!). Today’s post is about hosting guests with food allergies. I’m sure you all have lots of tips to help make it easier for hosts, so come on over and share them. Let’s make the world a safer place for our children by spreading awareness and knowledge about food allergies! My eBook, “No Allergens, NO Fuss!” is finally ready and available for purchase! I am so excited about this and can’t wait for your feedback (hopefully positive:)! Read more about it and purchase it here.